At first sight, SurveyCompare looks like a normal survey panel with a lot of opportunities. But is SurveyCompare a scam or really full of opportunities? In this SurveyCompare review I will give you all the details about what you really get from joining. As you can see from the headline of this review, it is not a survey panel I am very impressed with. But do not just take my word for it – continue reading and see what it has to offer, and then decide for yourself, if it is worth joining for you or not. If you instead want to go directly to my top recommended survey sites that are definitely worth your time, just click the link below. 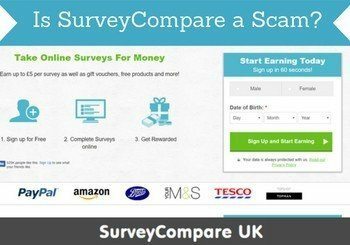 What is SurveyCompare and what does the site offer? SurveyCompare.net is also known as SurveyCompare UK, but it also has sites with many other endings for different countries. It is the same kind of website, but you might find it with different names in different countries. The company behind the SurveyCompare is Marketing VF Ltd, which is a company based in the UK. However, it is unclear to me what this company actually is, as I will explain later. I just want to make it clear that this review is based on what I found out by testing the site myself and it is my opinion about what you get out of it. So take it as an opinion only and use it to form your own opinion and conclusion. When you first come to SurveyCompare’s website, it looks more or less like any legit survey panel. It clearly shows that you can sign up for free, take surveys, and then get paid in cash or rewards. And you can easily find the button to sign up for this. At first sight, SurveyCompare looks like any other survey panel. There are also pictures of the rewards you can earn like PayPal, Amazon, gift cards, and more. This is all very normal, and it looks like you can just sign up and start taking surveys. However, it is not like a normal survey panel – it is in fact not even a survey panel. It is a site that is build to recruit members for survey panels. Nothing as such wrong with that. I am also happily referring people to the survey sites that are worth joining. I do however think SurveyCompare is transparent about what it offers if you sign up. That is the main reason I created this review. Not because it is a scam or it is dangerous to join, but just simpky because I think any potential user has the right to know what really to expect and what they get beofer signing up. When you sign up you have to fill out your contact info like on any other survey site. The next step does however not take you into a platform, where you can start taking surveys. You are instead getting a list of survey sites they recommend you to join. In the sign-up process, you get a list of survey panels. You do not sign up for them right away, but just select the ones you think sound interesting. When you have chosen the survey panels you want to sign up for, you can continue. All you now get is a message saying you have to check your email, and then have to click the link to each survey panel in the email to sign up for them. You do not get access to SurveyCompare as such as there is no members area – you just sign up and allow them to send you links to survey sites, so they can get paid a commission. When you have signed up, this is the message you will get. There is nothing as such wrong with this and with signing up to receive news and offers about paid surveys. What I do, however, not like about SurveyCompare’s approach is that it is not transparent what you get, in my opinion. It is set up and looks like you are going to sign up for a survey panel where you can earn, but you do not get access to any. You just receive links, and then you have to sign up for the actual survey sites. In my opinion, a waste of time, as it does not provide any value to sign up for SurveyCompare. It is just an extra step you have to take instead of just signing up directly at the survey sites. You can see it is only a comparison site and a survey aggregator if you look closely and have taken paid surveys before. So SurveyCompare is not trying as such to hide what it offers. But if you are new, I just do not think it is clear enough what you will get. But basically, all you can do on SurveyCompare is to sign up to have them send you some links. However, to be fair I want to mention that all the survey sites I have seen they send links to are legit survey sites, and they are not trying to get you to sign up for the scam sites that cost you money. Also, I like that in the FAQ section they are very honest about the income potential. they mention that it will not be a way to make a full-time income and will not make you rich. In my opinion, it is still not worth joining, but at least they only promote legit sites. You actually do not get paid on SurveyCompare itself. Even though you can see images of PayPal, Amazon, etc. on the website. But as already mentioned, you do not as such become a member of SurveyCompare. You just get links to survey sites. 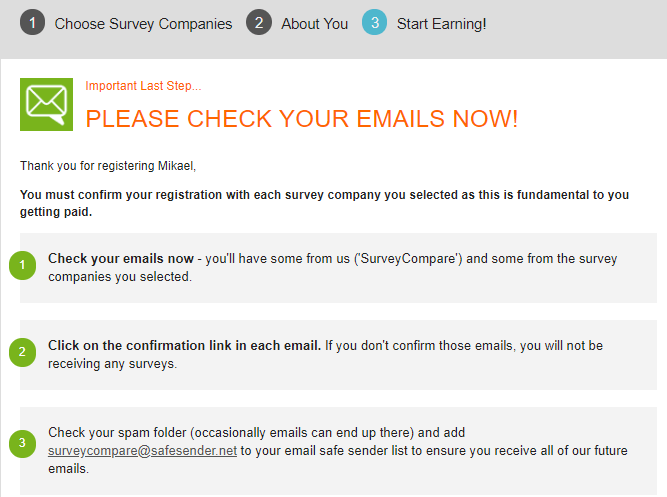 So you will also not get paid by SurveyCompare, but by the individual survey panels. The rewards they show and mention are real – you can get paid through PayPal when taking surveys, which is my personal favorite method, and gift cards, and Amazon are also very often available on survey sites. So in that sense, the rewards are real, but you will just not get them from SurveyCompare. Who is really behind SurveyCompare? I have already mentioned that Marketing VF Ltd is behind SurveyCompare. However, I found some very strange things in relation to this, as I was researching and testing SurveyCompare. I am not sure what the info means, but I think it is important to know. I wanted to know more about Marketing VF Ltd, but it was difficult to find any real info. I found the name and location listed a couple of places, and both times it said it is in London. However, what is very strange is the links to the company website. On Bloomberg.com there is a link to the company website address, but it is a link to a website that compares solar panels, which has nothing to do with survey panels. On LinkedIn there is instead a link to a website that compares prices on franking machines. It looks like the company has several websites that are similar to SurveyCompare, but just within other niches. Nothing wrong with having more websites, but it seems strange that the info I was able to find online is so inconsistent. Furthermore, on the official SurveyCompare Facebook page, the official website link takes you to a blog about how to save money, and the blog has not been updated since 2017. For me, this sends a signal that the company has too many things they are trying to send me to, and in different directions, and there is a lack of quality in my opinion. It does not mean it cannot be worth it and that it is not legit. I am just presenting my findings and what I think about it. Signs SurveyCompare is not worth it! It is probably clear to you already that I do not think it is worth joining SurveyCompare. I, however, want to mention one more thing I noticed on the website. There is some information about some survey sites. 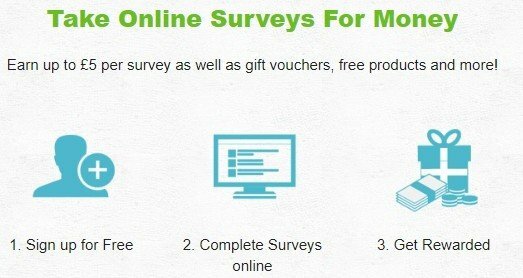 Mostly just factual info about what kind of rewards the different survey sites offer etc. But there are also user reviews displayed below these survey sites. User reviews can be great, but they can unfortunately also easily be manipulated or faked. It says you can leave a review on the site, but I was not able to, so not sure where they come from. However, many of them do not seem natural. Let me give you an example. An example of a review of a survey site on SurveyCompare. 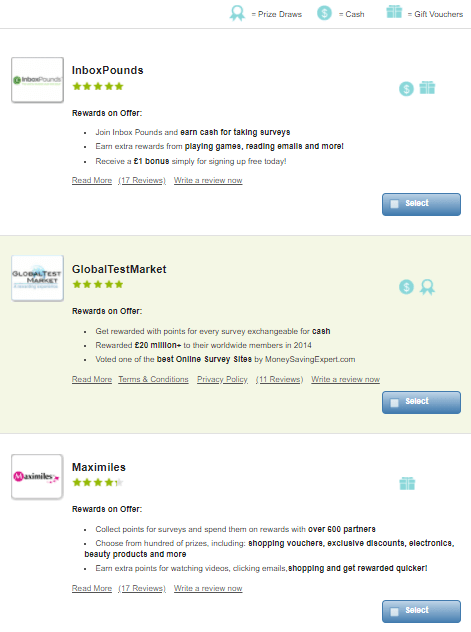 The above review is of the survey panel GlobalTestMarket, which is definitely a legit platform worth joining. But it sounds a bit unnatural, doesn’t it? It really does not sound natural, and in general, the star ratings of the survey panels are very high compared to the ratings on most other review sites with user reviews. This is not really natural compared to how people usually write reviews on similar sites. I am not saying that I can know for sure some reviews are fake. I am just saying many of them do not look natural. If you are interested in joining Surve, of course,you of course need to known who can join. As the name is SurveyCompare UK, you have probably figured out that it is only people from the UK, who can join. Or more correctly – people who write a UK postal code, when they sign up. However, SurveyCompare does also have websites for many other countries, but where it offers the exact same options. In general, I do not think it makes much sense to sign up for SurveyCompare. There are so many great survey sites, so there is no reason to waste your time on SurveyCompare. Just go to some of these great sites directly and sign up there. Here at the end, I just want to sum up the pros and cons of SurveyCompare to give you a better overview. To be fair I want to say that it is not dangerous to join SurveyCompare. It is only promoting legit survey sites, and it is free to join. BUT in my opinion it is a waste of time. You do not get any value out of signing up, it is nothing but a bunch of links. But if you are interested in getting these links and signing up for their newsletter, then it might be the right site for you. Now at least you know exactly what you will get and that you do not get surveys directly on SurveyCompare. Overall, if you want to make money by taking surveys, there are great opportunities, but SurveyCompare is not one of them, in my opinion, as it is not an actual survey site. You can click the link below to see my top recommended survey sites, where you will be able to earn directly on the sites. If you have any comments, questions, or have any experiences with SurveyCompare yourself, I would love to hear from you in a comment below. SurveyCompare is legit, but you do not necessarily get what you expect. The site only works with legit survey panels, but you will not get any in-depth info out of signing up, and you will not as such be able to make money on SurveyCompare. 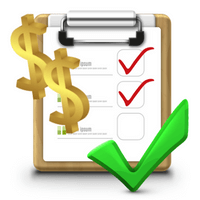 You will just get access to a list of survey sites you can then join to earn there. So if you only want to join sites where you can earn on the sites themselves, there are many that are a lot better to join. Thank you so much for your review.it is very helpful and educational for us starting into joining survey panels. Thanks for the feedback Lorenza. Glad you found the review helpful. You’ve actually been very helpful. SurveyCompare does in fact do exactly what they say in their name, it just seems so “honest,” but reading your review, well, it doesn’t seem so. This occurrence or type of practice is quite common online. It appears to be a site which basically deceives the uninitiated such as myself. But… there’s always someone or many who will sign up to them and stay with them until they realise how unnecessary it actually is. Thank you for providing 10 times more information freely. One only needs to look a little further and there are many who are happy to provide such info. Thanks for the feedback Paolo. Very happy to hear you found the info useful and it helped you. The good thing about SurveyCompare is that it only links to legit survey sites from what I have seen. But I just think it is completely unnecessary and it does not really help find the best options, in my opinion. And I do not think it is very clear for the uninitiated, as you say, what they can really expect so just wanted to try to make this clear so people make an informed decision and know what they get if they join. Thanks again for taking the time to give feedback and sharing your experiences. I appreciate it. I’ve been looking into joining a survey panel in order to get some extra cash. I have found your review very interesting and insightful. I am really glad I read it before signing up to Survey Compare, and now will be looking at the top 10 survey panels that you have recommended instead. Thank you very much for the feedback Heather. Glad my review could help you. Hope you will enjoy the survey panels you end up joining. Feel free to come back and share your experiences about them and ask, if you have any questions. What an interesting review and how involved Survey Compare is when you dig deep, as you obviously have done. This kind of information is very useful for those looking to try surveying for some extra cash. Because of your review, I will not be looking at this company. What a good idea to have the top sites for each country. You’ve done a lot of work on these companies. Being in the UK, I certainly will be checking out those that you recommend for UK residents. You’ve saved me a lot of time, thanks a lot. Thanks for your comment Ches. Sounds like a good idea for you not to waste any time om SurveyCompare. While there is nothing bad about creating a platform that will show you information on all the available survey sites on the wide web, I do not understand why SurveyCompare hides its true identity. They would be way more successful, if they plainly stated what they offer. A bad business tactic and on top of that they are for UK citizens only. What a shame. Businesses like this fail to understand the value of being legitimate. And even if you give them a shot, the confirmation email you get leads you to a whole different survey platform. I think they need to reconsider their business model and approach to potential customers. I agree that there is nothing bad in creating a membership platform that shows a list of survey sites. But SurveyCompare does not even provide a very good list of survey sites, and you can not actually become a member. You just give your info so they can send you offers, but make it look like you can become a member and get access to a lot of info. In my opinion it is a complete waste of time to join it, and I do not like when websites are not clear about what they actually offer.